A bird flu pandemic would impact all Jasperites, say municipal officials who stress that everyone must work together to prepare for and respond to an outbreak. Many experts predict that an influenza pandemic will occur in the next five to 10 years. The Municipality of Jasper and Aspen Health have both initiated Pandemic Contingency Plans. But according to Greg Van Tighem, Jasper’s fire chief and director of disaster services, businesses and organizations in town have a responsibility to develop individual plans to deal with an influenza pandemic. An influenza pandemic would have a significant impact on staff all over town, many of whom fulfill important roles, such as providing groceries or fuel, Van Tighem said. He estimated that about 35 per cent of an operation’s workforce would be affected by a bird flu outbreak at any given time. People are naturally afraid to go out in public when a pandemic hits, for fear of becoming ill, Van Tighem said. In preparing a pandemic influenza plan, Van Tighem said business owners and heads of organizations should separate their services into three categories: essential, necessary and desired. Van Tighem said businesses and organizations should plan to default to only providing essential services in the worst-case scenario. He added that employers should define the circumstances under which their plan to offer only essential services would be triggered. In the event of an influenza pandemic, the municipality would open a Coordination Centre to communicate with the community, the health region, Parks Canada and other provincial and federal organizations. Immunizations would also be provided through the Coordination Centre. Influenza vaccine is always in short supply in the initial stages of a pandemic, Van Tighem said. Bird was first detected in Bangladesh just outside of the capital, Dhaka, in March. Since then, the virus has spread into the northern districts of the country and led to multiple poultry farm closures and the culling of hundreds of thousands of birds. The virus now appears to be spreading west. Just under a quarter of all the districts of Bangladesh have now reported outbreaks of H5N1. Bird flu has spread to another district in Bangladesh forcing health and veterinary workers to cull 5,000 chickens, officials said on Wednesday. Sixteen out of Bangladesh's 64 districts have been affected by the virus, but there have been no reported cases of human infection. About four million Bangladeshis are directly or indirectly associated with poultry farming. On Wednesday, Czech authorities confirmed that the H5N1 virus was found in chickens at a poultry farm only four kilometres from another farm where 6000 turkeys were culled last week to stop the spread of the virus. The virus has also been found in wild birds in Germany, near Nuremberg. On Tuesday came reports that more infected swans had been found in Germany's eastern districts. While it may still be possible to contain the two outbreaks, clearly European bird flu experts are nervous about the discovery of the virus in what would appear to be growing arcs of infection. Zbynek Semerad, a spokesman for the Czech veterinary services, said on Wednesday the H5N1 virus had been confirmed by a national laboratory. He said it was "the most serious animal infection" in the country since an episode of foot-and-mouth disease in 2001. Czech authorities suggested the bird flu had been detected for the first time in Czech domestic poultry which could be due to wild birds contaminating litter. The infection could have been transferred between the two poultry farms which belong to the same cooperative on the shoes of a worker or on a car tyre. All previous 13 cases of bird flu in the Czech Republic since March 2006 had only affected wild swans. Some 28,00 chickens as well as all the poultry in the village of Norin will be destroyed, Czech officials said. Scotland is hosting an international summit on bird flu, amid growing fears that the threat of a global pandemic has not abated. It has been organised by the Avian Flu Task Force under the United Nations' international convention on migratory species, and includes delegates from Europe, Africa, South America and Asia. They will review outbreaks of avian flu around the world, which have led to the deaths of 191 people since 2003, and examine issues including the surveillance of wild birds in relation to the disease. Delegates will also discuss contingency planning and response strategies for outbreaks and what information is needed to understand potential infection routes and further local spread. Professor Colin Galbraith, director of policy and advice at Scottish Natural Heritage, who is a member of the task force, said: "Bird flu is one of the biggest international challenges that exists today. It knows no boundaries. Scientists across the world must work together to understand the nature of the disease and to contain any outbreaks. "It is crucial there is ongoing contact between countries and we share and learn from each other. The range of delegates and countries represented is a reflection of the seriousness of this issue across the world." Has Indonesia's H5N1 Strain Become Resistant To Tamiflu? For many countries of the world, Tamiflu is their one and only true medical defence against the H5N1 virus. Hundreds of millions of Tamiflu pill courses have been stockpiled, and countries like Australia have supplies ready to be flown into the H5N1 "hot zone" Indonesia within 24 hours, if needed. Jennifer McKimm-Breschkin says laboratory testing shows the viruses from Indonesia are 20 to 30 times less susceptible to the drug as compared to H5N1 viruses that circulated in Cambodia a couple of years ago. ...she says they may help to explain the high death toll from H5N1 in Indonesia, where 80 of 100 patients have died of the disease. Some 78,000 more chickens have been culled in Bangladesh in the past week following confirmation that the virus had appeared in a 15th district. The H5N1 avian influenza virus was detected outside the captial, Dhaka, in March. From Central Bangladesh, it has now spread quickly to the districts in the north of the country. The latest outbreak was reported from three farms in Lalmonirhat district, 400 km (250 miles) northwest of Dhaka, an official said. "We have culled a huge number of chickens after the virus spread to the new district," said Khalilur Rahman Siddiqui, joint secretary, ministry of fisheries and livestock. With the latest cull, about 250,000 chickens have now been slaughtered and more than 2.2 million eggs destroyed in 15 districts since March. There have been no reported cases of human infection. About four million Bangladeshis are directly or indirectly associated with poultry farming. Several thousand poultry birds have been found dead in Togo recently, most of them in the past week on the one farm in Sigbehoue, 45 kilometres (30 miles) east of the capital Lome. The agriculture ministry said on Thursday that measures had been taken to try and contain the possible spread of the virus, notably the slaughtering and disposal of infected poultry. Before Friday, no cases of H5N1 bird flu had been officially discovered in Togo, which since October last year had banned the import of live poultry and poultry products from countries affected by the virus. Ghana, a neighbour of Togo, reportedly recorded its third H5N1 outbreak last week, in a town close to the Togo border. The H5N1 virus has been found in seven dead birds in Southern Germany. One goose, a duck and five swans all tested positive. Bird flu hit EU nations hard in 2006, early 2007. H5N1 infections showed up in wild birds or farmed poultry in Germany, Slovakia, the Czech Republic, Hungary, Sweden, France, Greece, Italy, Austria, Poland and Denmark and Slovenia, according to the World Health Organisation. In Egypt, a four year old bird has reportedly tested positive for H5N1 infection. In Indonesia, a three year old girl has caught the avian influenza virus. Only ten days after Vietnam officially announced the death of a 20 year old man, killed by the H5N1 virus, comes the news that a 28 year old woman has now died in Hanoi. The virus killed her only ten days after she became infected. These two victims are the first human bird flu casualties in Vietnam since November, 2004. These two deaths brings the Vietnam total of human deaths from the virus to 44. Since last month, five human cases of bird flu have been reported in Vietnam, two of whom have died. Two others who had contracted the virus have already been released from hospital. Communist Vietnam, once the nation worst hit by avian influenza, contained earlier outbreaks through mass vaccination campaigns, the culling of millions of poultry, and public education campaigns. But the virus has come back strongly this year, hitting scores of poultry farms in an unusual summer-time outbreak, especially in the densely populated northern Red River delta region in recent weeks. The outbreak of the H7 strain of avian influenza in Wales may prove to be more dangerous, and impact harder on the health care resources of the UK, than originally thought. While none of the four people hospitalised due to infection from H7 in Wales last month died, the infection and subsequent illness was serious enough to soak up medical resources already in short supply. "When you have to hospitalize someone for respiratory illness in the U.K., where hospital beds are hard to allocate, then the person has a serious illness," said Jonathan Nguyen-Van-Tam, a senior lecturer at Public Health Laboratory Services in London. "In this outbreak, we had four people who tested positive for H7 influenza strain, and three of them were hospitalized," he told United Press International. "One person was a candidate for intensive care before he finally came around. "I think we need to reconsider the H7 strain on the basis of this outbreak," Nguyen-Van-Tam said in reporting how British authorities dealt with the disease encountered on small farms in Wales in the spring of this year. ...a lesser-known relative of the H5N1 virus may be emerging as an equally formidable threat, based on what health authorities encountered recently on a handful of tiny chicken farms in Wales and northern England. Nguyen-Van-Tam said 23 people developed some form of influenza-like symptoms during the course of the (recent H7 virus in Northern England) investigation and cleanup. Fourteen of those individuals had secondary contact, but none showed immediate exposure to H7 virus. Nguyen-Van-Tam said the investigation was even more difficult because the outbreaks occurred during the seasonal influenza outbreak, making it difficult to determine with sophisticated testing if the patients were infected by the seasonal bug or by avian flu. "This was a challenging incident," Nguyen-Van-Tam said, "complicated in terms of time and space. No evidence of person-to-person transmission has been found, but serology tests are awaited." What happens if someone infected with H7 is then exposed to H5N1? There is little research to be found online that explains the results of multiple infection by various strains of avian influenza. Clinical signs of bird flu range from respiratory distress to coughing and sneezing, to dead chickens. If no clinical signs can be observed – asymptomatic chickens - the risks of the virus spreading are much higher, which also means that humans can become more easily infected with bird flu due to the virus's ability to adapt to new environments and hosts. Taking into account reports yesterday that Indonesia's 80th bird flu victim died after eating infected chicken meat, the 'invisible bird flu' development means that entire poultry stocks will need to be regularly tested, or vaccinated, and poultry meat will have to undergo more rigorous inspections and testing before it reaches the marketplace, particularly in countries like Indonesia where H5N1 is already at epidemic levels in bird populations. Should a wave of human bird flu deaths as a result of eating infected poultry, poultry that showed no symptomatic signs of infection by the virus, the impact on domestic poultry sales, and exports, will be devastating. The largest poultry companies around the world have mounted aggressive PR and marketing campaigns, costing tens of millions of dollars, to ensure consumers that they cannot become infected with the H5N1 virus from eating chicken or duck meat. A usual added proviso is that the meat is safe if "properly cooked". In early 2006, Vietnam mounted a huge poster and advertising campaign warning poultry consumers that they needed to boil poultry meat until it was yellow before it should be considered safe to eat. There has been at least three deaths believed to have resulted from eating infected poultry in as many months. Marketing and PR alone will not assure the public this food product is safe if deaths continue. While some quarters of the mega-billion dollar global poultry industry will shout from the rooftops that you cannot catch bird flu and die from eating chickens, people still catch bird flu and die from eating chickens. Chickens infected with the bird flu virus. But now we know that a strain of the bird flu has mutated and chickens can carry the virus without showing any outward signs of infection, how are Indonesians in particular supposed to avoid eating H5N1 infected chicken meat? An Indonesian man died of bird flu after eating sick chickens, a leading health official said Thursday, raising the national death toll to 80. The symptoms were the standard : cough, headaches, high fever. He died three days after being hospitalised, and presumably despite being treated with antivirals like Tamiflu, which are now standard issue for any bird flu patients in Indonesian hospitals. Perhaps Vietnam had the right idea back in early 2006 when they distributed large posters through the cities showing chicken meat that had been boiled for more than half an hour until it was yellow. Reuters has run a short, but comprehensive summary of bird flu related facts and figures, resulting since the "outbreak of highly pathogenic H5N1 avian influenza began in Asia in 2003". Amongst the more startling is this one : In the past twelve months alone, some 30 countries have reported outbreaks of bird flu virus. Some 59 countries and territories in total have reported outbreaks since 2003. At least 190 people have died from the bird flu virus in the past four years, according to the World Health Organisation, from an infected base total estimated to be more than 320. However, most experts would agree that countries like Indonesia, China and Vietnam, with huge population masses spread across hundreds of islands and rural territories, and with vast numbers of people sharing their living quarters with poultry, have probably had higher than the WHO official totals of bird flu infections and subsequent deaths. WHO has confirmed human deaths in Indonesia, China, Vietnam, Egypt, Nigeria, Laos, Turkey, Cambodia, Iraq, Thailand and Azerbaijan. * According to WHO, Vietnam and Indonesia have the highest number of cases, accounting for 121 of the total deaths. * H5N1 is not the only bird flu virus. There are numerous strains. For example, an outbreak in 2003 of the H7N7 bird flu virus in the Netherlands led to the destruction of more than 30 million birds, around a third of the country's poultry stock. About 2.7 million were destroyed in Belgium and around 400,000 in Germany. In the Netherlands, 89 people were infected with the H7N7 virus, of whom one (a veterinarian) died. * The H5N1 virus made the first known jump into humans in Hong Kong in 1997, infecting 18 people and killing six of them. The government ordered the immediate culling of the territory's entire poultry flock, ending the outbreak. Chickens infected by bird flu in Indonesia are now mostly symptom-free, confounding efforts to fight the virus in the world's hardest hit country, an Agriculture Ministry official said Monday. "It's really giving us a headache," said Musni Suatmodjo, the director of animal health. Chickens are testing positive for the H5N1 virus, but they are staying healthy, making it difficult to identify which are infected. John Weaver, of the U.N. Food and Agriculture Organization, noted that several researchers have said many infected chickens appear to be surviving in Indonesia, triggering questions about whether the virus may have become less pathogenic. It's an interesting and important question. If more birds can carrying the H5N1 strain of the bird flu virus, and survive, and show no outward signs of infection, this may mean that further mutations of the virus could prove far more deadlier than what has been seen so far. The virus may be becoming less pathogenic, or simply more effective in transmitting itself. A More Effective Method For The Mass-Culling Of Infected Birds? More than 23 million poultry birds have, reportedly, been culled across the US through anti-bird flu extermination programs since the late early 1980s. The options available used to be gassing the birds, or electrocuting them, breaking their necks by hand, or simply chopping them up. There has been a lot of debate, particularly in countries where bird flu is now an epidemic, or quickly heading that way (Indonesia being the prime example), about which method of mass culling is the most effective and least cruel. These soapy air bubbles, adapted from what firefighters use to smother blazes, can smother birds within several minutes, with minimal contact between workers and infection. The problem is that some experts consider it less humane than gassing. They say carbon dioxide at least knocks birds unconscious before it poisons them. Foam simply fills their windpipes and strangles them. “You might as well drop them in a bucket of water,” fumes Dr. Mohan Raj, a British veterinarian at the University of Bristol who specializes in animal welfare during disease control. 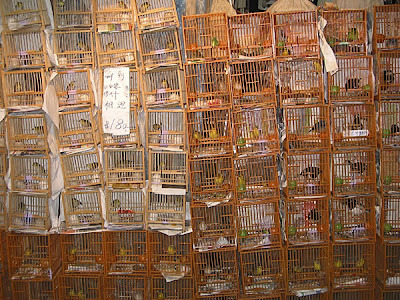 “There is no really satisfactory, humane method to depopulate a full houseful of birds,” says animal ethicist Bernard Rollin, at Colorado State University. Whatever the shortcomings of current techniques, federal and industry officials insist they’re ready for a big outbreak. But they acknowledge they’d probably use foam and gas as needed — and some uglier methods too. In the worst case, with people dying, the industry might be forced simply to close barns and let birds die of thirst or disease. Even a short pandemic, of only a few weeks duration, killing a few thousand people, is expected to absolutely devastate the economy of the country most unfortunate to suffer such a fate. What makes economists so nervous about the dreaded H5N1 pandemic is that the idea of a "short pandemic" is fiction. The World Health Organisation, and most recently Australian health minister Tony Abbott, talk of pandemic 'waves' lasting a few months each, with perhaps as many as three or four subsequent 'waves' in the next two or so years. The economic devastation comes from such a wide array of financial impacts it's almost impossible to sum them up briefly. But the short version is this : when people start dying of bird flu, and a pandemic level outbreak is announced, most people will stop going to work, and public gatherings and public transport systems will be shut down, to halt the spread of the infection. People won't be going to the mall, but there won't be people to serve them or stock the shelves even if they did go. Now imagine that paradigm across every aspect of the social and business life of a city, or large town. The "climate of fear" under discussion in the story below also includes the possibility of widespread panic, and subsequent extremely negative economic impacts that follow, even when the human death tolls are low, and the spread halted quickly. Well, the World Health Organisation has spent three years now scaring the crap out of people about how dangerous and deadly H5N1 can be, and how careful people need to be around poultry birds that may be infected. Of course there is going to be a "climate of fear", the WHO helped to create this reality. Asia-Pacific health ministers said on Friday that a "climate of fear" that accompanies the outbreak of infectious diseases such as bird flu could have a devastating impact on Asia's economies. The APEC Health Ministers conference in Sydney ended on Friday with a commitment to share virus specimens and vaccines and to work to encourage investor and consumer confidence to help Asia-Pacific economies recover in the event of a pandemic. "The climate of fear that disease outbreaks such as avian influenza bring can rapidly sap the confidence and enterprise that underpins the economic dynamism of our region," Australian Health Minister Tony Abbott told the conference. The health ministers endorsed a plan called "APEC Functioning Economies in Times of Pandemic Guidelines" which aims to assist in managing economies during a pandemic. The guidelines cover communications, essential services, financial systems and movement between and within countries. "We recognise that healthy populations contribute to economic growth and development. Conversely, any threat to the health of a population can have a devastating effect on prosperity," the ministers from the 21-member Asia-Pacific Economic Cooperation forum said in a statement. The ministers said that the Asia-Pacific needed to replicate the co-operation seen during the SARS respiratory crisis in 2003 to combat the threat of a bird flu pandemic. "The global nature of pandemic influenza and other virulent disease demands international solidarity, co-operation and co-ordination of efforts...for the sharing of information and resources," said the ministers. IBM said Thursday that it is giving health authorities and others around the world expanded access to free software it partly developed in San Jose to help track bird flu and other infectious diseases. The software - dubbed Spatiotemporal Epidemiological Modeler, or STEM - can create computer models of how diseases spread geographically. IBM said it would make the software available on the Web site of the Eclipse Foundation, which provides open-source software. IBM last year announced that it was providing STEM to the World Health Organization, the U.S. Centers for Disease Control and others as part of a global initiative to help stop the spread of bird flu. The girl was admitted to a hospital after developing flu-like symptoms, Shahin said. She died after testing positive for the deadly H5N1 strain of bird flu. She is from the upper Egyptian town of Naqada in the governorate of Qena, approximately 300 miles south of Cairo. The ministry believes the young girl had come into contact with infected birds that were being raised at her home. Egypt is the worst hit country outside East Asia, having documented 35 human cases. Of those infected, 14 have died and the other 20, not including the current case, have recovered, MENA reported. Egypt first reported the H5N1 strain of bird flu in deceased poultry in February of last year and the first human case the following month. Officials from Indonesia's avian flu commission said today that the H5N1 avian influenza virus may have mutated in a way that makes it more transmissible from birds to humans, but a World Health Organization (WHO) official said the WHO had seen no evidence of such a change, according to news services. Bayu Krisnamurthi, chief executive for Indonesia's National Committee for Avian Influenza Control and Pandemic Influenza Preparedness, told reporters that in the past, human infections required high-intensity and high-density exposure to the H5N1 virus, according to a Reuters report today. "There are now suspicions that this [infection] has become easier," he said, adding that a mutation has not been confirmed yet. Wayan Teguh Wibawan, a microbiologist from Indonesia's avian flu commission, told Reuters that the suspicions are based on preliminary results of genetic tests at laboratories in Indonesia. The amino acid structure of poultry H5N1 samples is becoming increasingly similar to that seen in human H5N1 samples, he said. The similarity in amino acid structure makes it easier for the virus to attach to receptors on cells that line the throat and lungs, Wibawan told Reuters. The virus would have to attach readily to human cell receptors in order to easily pass from birds to humans, he said. Wibawan told Reuters he had noted "gradual changes" in the virus samples he receives each month, but he gave no other details. However, Gregory Hartl, a WHO spokesman, told Reuters that the WHO has not seen any evidence that the virus has become more transmissible to humans. The WHO has received very few H5N1 isolates from Indonesia recently. Hartl told CIDRAP News today that the agency has received just three Indonesian H5N1 samples, gathered from two patients, this year. "Without virus characterization, we cannot say whether the virus has changed or not," he said. This is not good news. Bird flu watchers have long feared two key mutations in the H5N1 virus : the first mutation being one that allows the virus to pass more easily from bird to humans, the second major mutation being the one that then allows the virus to spread easily between humans. Indonesian bird flu experts are now terrified that the H5N1 has just undergone that first major mutation. The H5N1 bird flu virus in Indonesia may have undergone a mutation that allows it to jump more easily from poultry to humans, the head of the country's commission on bird flu control said on Wednesday. "In the past it took exposure of high intensity and density to the virus to get infected. There are now suspicions, early indications that this has become easier," Bayu Krisnamurthi told reporters. A microbiologist at the bird flu commission said the suspicions were based on preliminary findings of molecular genetic tests conducted at laboratories in Indonesia. "Virus samples from poultry cases have increasingly shown a similarity in their amino acid structure to virus samples extracted from humans," Wayan Teguh Wibawan told Reuters. "This makes it easier for the virus to attach to human receptors," he said, referring to receptor cells lining the human throat and lungs. For the H5N1 virus to pass easily from bird to human, it would have to be able to readily attach itself to these special cells. Wayan said he had spotted "gradual changes" in the virus sample he receives every month. Scientists are worried about the virus's persistence and ability to adapt to new environments and hosts, fearing this increases the chances of the virus mutating into a form that can jump easily between people, triggering a pandemic. Contact with sick fowl is the most common way humans become infected with bird flu. Indonesian authorities are also concerned that widespread ignorance in their country about the dangers of the bird flu virus is negatively impacting on their ability to fight its spread. Efforts to bring the epidemic under control will depend on better public education, according to bird flu expert Bayu Krisnamurthi. He was addressing a news conference on the second anniversary of the first human infection in Indonesia. Mr Krisnamurthi, the head of the committee in charge of bird flu control, admitted that while the majority of Indonesians knew of the disease, only one in seven realised it could kill them. Given that the disease is endemic in poultry across most of Indonesia, this suggests that the authorities have a long way to go if they are ever going to arrest the spread of the virus. Until Indonesians are aware of the possibility of catching the disease, and of the likelihood of dying once infected, they will not take proper precautions and will not seek immediate medical help if they come into contact with diseased birds. Recent figures on the ratio of bird flu infections in humans to subsequent deaths reveal that the H5N1 virus appears to have a mortality rate as high as 87%. Indonesia has seen at least three more human bird flu fatalities in the past six days. Does the US government now view the possibility of a bird flu pandemic as less of a threat than it did back in 2005, or are they cutting funding to what were once deemed "essential" pandemic related funding programs because the Iraq War is soaking up increasingly rare government dollars right across the board? ....in the latest Defense spending bill, a mere $13.2 million to address avian flu research and monitoring was provided. But the bill was passed without $650 million in pandemic preparedness spending that had been included in an earlier version of the bill. The earlier bill was vetoed by President Bush because it set a timetable for starting a US withdrawal from Iraq. The exclusion of the pandemic money doesn’t mean Congress won’t appropriate anything for that purpose this year, but it does suggest that a considerable delay is likely, said Richard Hamburg, government relations director for Trust for America’s Health, a public health advocacy group based in Washington, DC. The deleted $650 million included $625 million for vaccines, antivirals, other medical supplies, and diagnostic and surveillance tools, according to a text of the earlier bill that was vetoed (HR 1591). The sum also included $25 million to compensate individuals for any injuries caused by H5N1 influenza vaccines. The World Health Organisation repeatedly issues media releases saying the world must not lose focus on pandemic prevention and preparedness as human victims of the H5N1 virus lessen (on last year's figures), but the United States government appears to be taking an approach that says, "We won't pour tons of money into funding vaccine research, but we will tell you about lots of ways you can prepare your business, home and community to cope with a pandemic outbreak." The actual value of creating a vaccine for a mutated virus strain that has yet to show itself completely has always been debatable, but the WHO will no doubt be troubled by the US government appearing to take its foot off the accelerator in preparing the country for the expected pandemic. It will probably provide little comfort to Americans to know that President Bush can now seize control of the National Guard in the event of a pandemic, and can bypass FEMA to allow the White House and the Pentagon to control how the government as a whole will deal with a storm of contingencies and problems resulting from a pandemic that are all but impossible to comprehend, let alone act on in a clear and decisive way. As with the people of New Orleans during the Hurricane Katrina disaster, Americans will probably have to get used to the idea that should a massive and extremely deadly H5N1 pandemic break out amongst the human population, they will be pretty much on their own. No doubt this is why so many of the state-level seminars and meetings being held across the United States today, encourage local governments and councils to prepare their communities and emergency responses independent of the government's still vague plans. When your local mayor tells you to put aside a few boxes of canned and dried food and a few dozen litres of water, it won't hurt to follow the mayor's advice. Just in case. Indonesia is believed to have recorded its 80th human victim of avian influenza last Friday. The second death in the archipelago in three days. A child thought to have been infected with bird flu died Friday, a day after being admitted to hospital in Medan, North Sumatra, an official said Saturday. The 11-year-old boy from Asahan regency passed away at Adam Malik hospital. The hospital's deputy director, Nur Rasyid Lubis, said the child was treated for one day at a clinic in Indrapura district before being taken to the hospital after displaying symptoms similar to those of bird flu. He said the victim was in poor health when he arrived at the hospital, giving the team of doctors little chance to save his life. He said it is likely the boy died after being infected with the H5N1 virus. Aside from displaying the symptoms of bird flu, the victim also had contact with fowl. An Indonesian girl died of bird flu after coming into contact with an infected chicken, bringing the national death toll from the H5N1 virus to 79, a Health Ministry spokeswoman said Sunday. The 15-year-old girl died Tuesday after being hospitalized for two days in the city of Semarang on central Java island, spokeswoman Lily Sulistyowati said. The country's two official laboratories have confirmed the girl had the virus, she said. Another couple of years of mass poultry culls in China, Vietnam and Indonesia, and those countries will be crying out for a genetically modified chicken that will be resistant to the bird flu virus. Australian and British scientists are now racing each other to come up with a bird flu resistant chicken, knowing such patents will be worth billions in the coming decades. The spread of H5N1 has already cost the world poultry industries more than $10 billion since the virus resurfaced in 2003, and led to devastating market impacts as consumers turned away from poultry meat, following bird flu scares. CSIRO scientists in Victoria are aiming to be the first in the world to develop a genetically modified chicken immune to the killer bird flu. CSIRO's Geelong compound has begun the research, racing for time against British scientists at Cambridge University who are hungry for a breakthrough, News Ltd reported. Millions of dollars are at stake in the research, which would help farmers and breeders, replacing their chickens with flu-immune birds, the report said. The CSIRO team aims to make the chickens immune to avian influenza. The super chickens would have to be labelled genetically modified, but the report said they would still taste like regular chicken. Australian Animal Health Laboratory's Dr John Lowenthal said an avian influenza pandemic was a major threat. “We have an obligation to come up with a solution to it,” he said. “At the end of the process we are expressing what we would call transgenes into the chicken so that this becomes permanently incorporated into the chicken, into all of its cells." Should this superchook become a reality, we may see laws imposed, particularly in countries that have been devastated by bird flu in the past, that make non-bird flu resistant poultry illegal to sell, to own, to breed or even to eat. Welcome to the age of production line living food products, made to order. The 17 people, who are all connected to the outbreak, have been identified as suffering from flu-like symptoms, and include a healthcare worker and school girl. Wales chief veterinary officer Dr Christianne Glossop last week announced that the H7N2 strain of bird flu had been found on T’n Llwyn farm, in Llanfihangel Glyn Myfyr, near Corwen which has also been linked to the market. Owners Barbara Cowling and Tony Williams bought a 15-strong batch of 22-week-old Rhode Island Red chickens from Chelford Market three weeks ago. But the birds became ill and died. Almost 100 people, including 79 patients and staff at Ysbyty Glan Clwyd and pupils at Ysgol Henllan, near Denbigh, have now been given the anti-viral drug Tamiflu, which can lessen the severity and duration of flu, as a precautionary measure. In total 256 people who have been in contact with the infected poultry or people who have become ill have been traced by public health officials. The H7N2 strain of avian flu – a different strain to the H5N1 virus which has killed about 180 people in South-East Asia – can cause mild flu-like symptoms and conjunctivitis in humans. Assembly government officials last night said it was “too early to speculate” about the source of the outbreak. ...some within the North Wales farming community have questioned why the source of the outbreak has not yet been found, as record of all transactions are kept by the market itself.